For eight years, Wingfield/Sears ranked in the top 25 of Houston Business Journal's Largest Area Office Interior Design Firms. 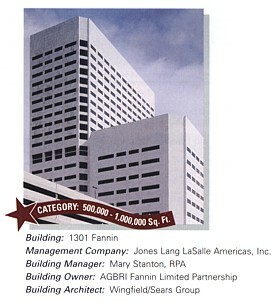 In 2001, Wingfield/Sears was recognized by BOMA International (Building Owners and Managers Association) with an Office Building of the Year Award, TOBY Regional Winner, for our interior work on the 800,000 sq. ft. 1301 Fannin building in Houston's central business district. Click here to view article from Real Estate & Construction Review.